The phorusrhacids, known commonly as the “terror birds”, were a diverse group of predatory flightless birds that inhabited South America from the early Paleocene to the late Pleistocene. The family Phorusrhacidae belongs to a larger order of birds known as the Cariamiformes or Cariamae, which originated during the late Cretaceous and appear to have become specialized for a primarily terrestrial lifestyle very early in their evolutionary history. In addition to South America, close relatives of terror birds were also distributed through Europe, Africa, and Antarctica during the Paleocene and Eocene. By the Oligocene, however, they had become extinct on all other continents except South America where they remained diverse. The terror birds themselves were prominent components of the carnivore-omnivore guild in South America throughout the Cenozoic together with sebecid* crocodylians and sparassodont* marsupials. At least one species, Titanis walleri, managed to colonize the southern United States after the Isthmus of Panama connected the two Americas during the middle Pliocene. Species within this family range in mass from 5kg to about 400kg (10 to 880lbs). 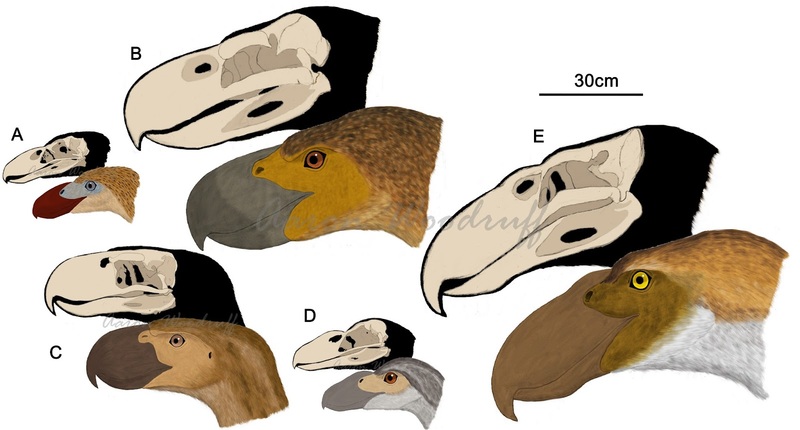 Terror birds continued to thrive in South America until they became extinct at the end of the Pleistocene together with many other types of large birds and mammals. 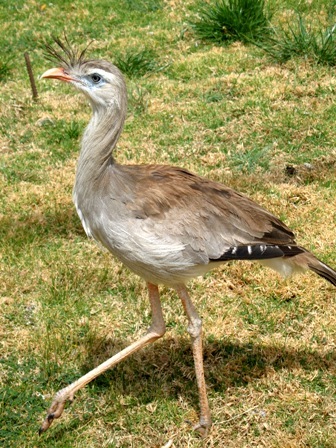 The closest living relatives of the terror birds, and the only surviving representatives of the Cariamae, are the two species of seriema (Cariamidae) from South America. These modern birds are still capable of flight but prefer to hunt on the ground. Terror birds had proportionally large heads with deep, laterally flattened beaks with a hooked tip for tearing flesh. The inner structure of the beak was reinforced by bony struts and the skull bones were tightly fused together for strength. The pelvis was especially large to act as a counterbalance. They had long, powerful necks which would have been held in an S-shaped position when at rest. Detailed studies of the neck vertebrae shows that they were particularly well-adapted at making swift movements in the sagittal* plane, which is an ideal motion for striking prey. The caudal* vertebrae also appear to be somewhat more developed than those of modern flightless birds, implying that the tail, though highly reduced, may have been functional as a rudder of sorts during the pursuit of prey. 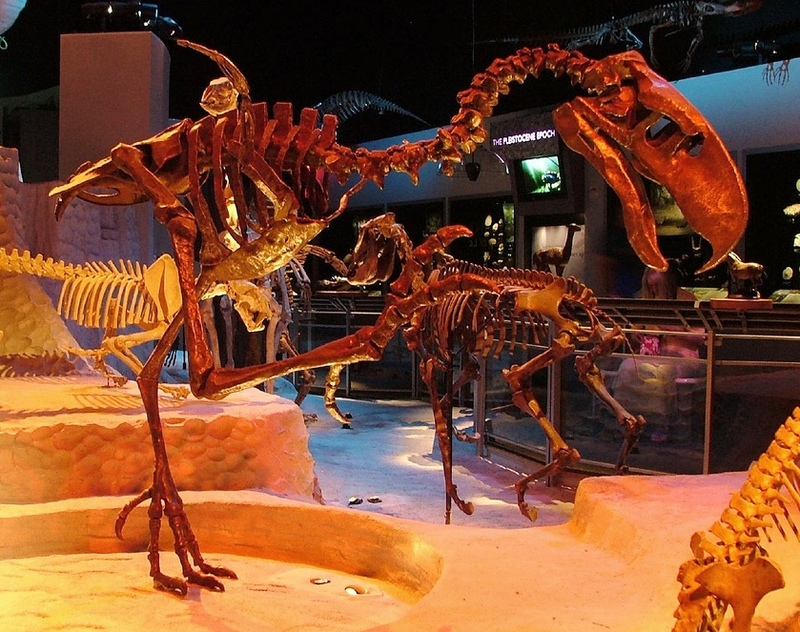 As with all flightless birds, the bones of the forelimbs are greatly reduced in terror birds and were possibly involved in stability and maneuverability while running. The overall skeleton is much heavier and sturdier than what would be expected for a flying bird of the same size. Terror birds were primarily carnivorous, as evidenced by their large heads and massive, hooked beaks. Recent studies have shown that the sense of hearing in terror birds was well-developed and particularly sensitive to low-frequency sounds, suggesting that these birds utilized deep, resonant vocalizations to communicate with one another. CT scans of the brain cavities have shown that the areas of the brain that deal with visual information and problem-solving are also well-developed, while the sense of smell was relatively less so. It seems likely that terror birds hunted using vision and hearing as their primary senses. Once captured and dispatched, smaller prey items would have simply been swallowed whole, while larger meals were torn apart by the birds’ massive beak. Studies of terror bird limb muscular and proportions suggests that they were capable of exceptional feats of speed and agility. The family Phorusrhacidae is divided into five subfamilies; Psilopterinae, Brontornithinae, Patagornithinae, Mesembriornithinae, and Phorusrhacinae. 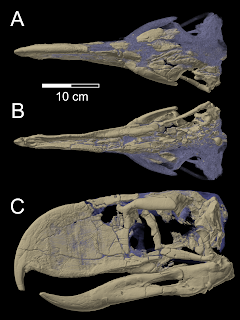 Restored skulls and heads of five terror bird species belonging to each of the subfamilies. The longest-lived terror bird lineage, the Psilopterinae have a temporal range spanning from the late Paleocene to the early Pliocene. They are characterized by relatively slender, lightweight bodies, proportionally thin hindlimbs, and small overall size. Members of this subfamily range from 5 to 15kg in body mass. Known species include Paleopsilopterus itaboraiensis (early Paleocene), Psilopterus affinis (late Oligocene), P. bachmanni (late Miocene), P. lemoinei (late Miocene), and P. cozecus (late Miocene). The brontornithines were large-bodied terror birds that existed during the Oligocene through to the early Miocene. Over time they appear to have been replaced by the Phorusrhacinae (see below) by the middle Miocene. Known species include Physornis fortis (late Oligocene), Paraphysornis brasiliensis (middle Oligocene to early Miocene), Brontornis burmeisteri (late Oligocene to middle Miocene). 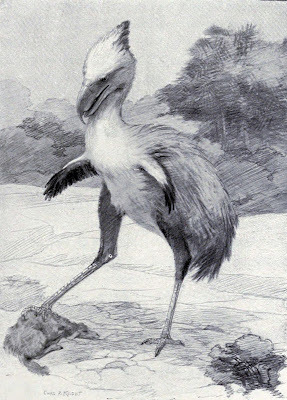 Patagornithines were mid-sized terror birds with lean bodies and slender limb proportions. Known species include Andalgalornis steulleti (late Miocene to Pliocene), Andrewsornis abbotti (middle to late Oligocene), Patagornis marshi (middle Miocene). The Mesembriornithinae are the shortest-lived and most diverse phorusrhacid subfamily, with a fossil record dating back to the late Miocene to the late Pliocene. Most are relatively small at around 10kg, while a few grew considerably large achieving estimated body weights of up to 70kg. It contains three genera and four species; Procariama simplex (late Miocene to late Pliocene), Llallawavis scagliai (Pliocene), Mesembriornis incertus (late Miocene to Pliocene), and M. milineedwardsi (late Miocene to Pliocene). The Phorusrhacinae, together with the Brontornithinae, include some of the largest of the terror birds, with species ranging in mass from 100 to 400kg. This subfamily first appeared during the middle Miocene and persisted to the end of the Pleistocene. Known species include Phorusrhacos longissimus (middle Miocene), Kelenken guillermoi (middle Miocene), Devincenzia pozzi (late Miocene to early Pliocene), Titanis walleri (late Pliocene to early Pleistocene). Caudal: of or referring to the tail of an animal. Sagittal: a vertical plane that divides the body into right and left halves. Sebecidae: an extinct group of terrestrial crocodilians endemic to South America until the late Miocene. Sparassodonta: an extinct order of predatory mammals endemic to South America until the Pliocene.